Looking northwest from the middle of the Wapihanne (White River), the bank to the left was the area of Wapiminskink, "chestnut tree place." The personal camp of Chief Kikthawenund (Chief Anderson) was to the left of the Eisenhower Bridge, seen in middle ground--or with a city map on the southeast corner at the intersection of Central and 8th Street. The red brick building in the background is the Madison County Jail. 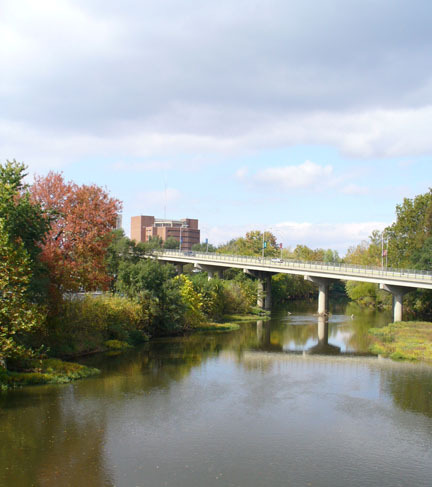 The rest of the skyline for Andersontown (Anderson) is hidden by the fall foliage which graces the river's banks, now part of a pedestrian parkway. 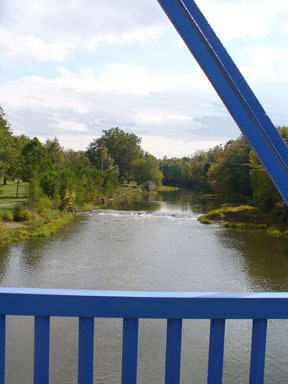 This view, looking between the blue, iron girders of the pedestrian bridge which spans White River, is looking southeast. Chief Kikthawenund would have seen members of the Lenni Lenape from Muncietown and Buck's Town canoeing around the far bend to his camp site. This Indiana Historic Marker sits in front of the Madison County Court House at the southwest corner. The marker reminds Andersonians: "This Public Square was part of Chief Anderson's Delaware Indian Village. 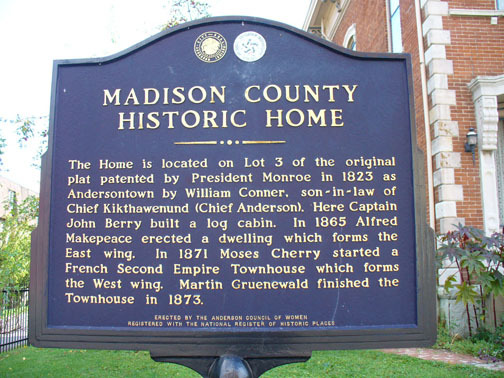 In 1827, thirty acres were donated to Madison County by John and Salley Berry to relocate the county seat from Pendleton to Anderson... Three of Madison County's Court Houses have been erected on this site." '...Wapiminskink was first settled by no more than fifteen or sixteen families. The site was selected in keeping with three criteria important to the Delaware. It must be elevated which allowed them to see an approaching enemy, have an abundant water supply nearby, and have fertile soil for growing food. The site chosen afforded all three as the village was situated on bluffs 75 feet above White River. Scattered throughout the site were numerous springs flowing with fresh water. To the north of the village was a flat fertile area where corn and other vegetables were planted. The surrounding forests were teeming with game and numerous blackberries, and the river had abundant supply of food. 'At its largest size, the village was spread over an area that today would include St. Mary's Church on the south to the Madison County Jail on the north. The river was its eastern boundary with possible some habitation on the east side of the river. Its western boundary would have included the area where the Madison County Court house now stands. Altogether this area encompassed approximately 30 acres. It was marked with gullies and ravines that led to White River. The deepest ravine was near the present corner of Eleventh and Main Streets. A stream that rose in the southwest part of present day Anderson flowed through there on its way to the river. 'We know the Indians maintained a large field in the rich bottom lands on the south side of the river stretching from about the intersection of Fifth and Main Streets westward along the river. ...as the population of the village grew to about 1,000 in 1818, more food was needed and the planting ground was expanded westward to almost Madison Avenue. 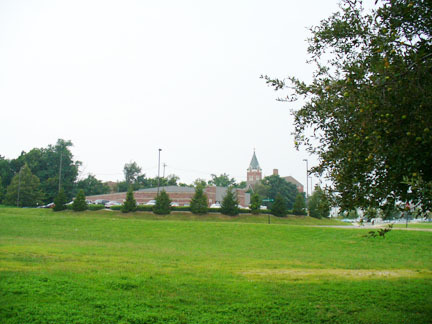 'The Delaware burial ground was located where the Anderson City building stands today. The area was roughly bounded by Eighth Street to near the Gruenewald House, and Central Avenue to Main Street. 'There was another important consideration in the Chief's mind when he selected the village site. Two forks of a famous trail that was vital to travel through the wilderness converged here. 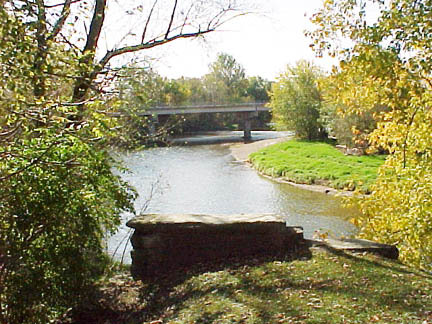 The trail was called the Conner Tail and it followed an already historic Indian trail which started at the mouth of the Miami River near Cincinnati wending its way past John Conner's trading post southeast to Brookville. It ran north through Connersville and then followed a northerly direction passing New Castle. Two miles north of New Castle the trail forked. The east fork proceeded to Old Town Hill, southeast of Muncie. The west fork turned slightly northwest until it reached Wapiminskink. After leaving Muncie the east fork traversed the countryside north of White river, and roughly paralleling it, until it crossed to the south side of the river at Wapiminskink. After crossing the river the fork ascended the river bank and at the top of the bank it joined the west fork and became one trail again. This junction today is at or within a few feet of the intersection of Wheeler and Cincinnati Avenues in Anderson... The Conner Trail then passed through the village and exited on its west side following closely what are today west Eighth Street Road almost to Strawtown in Hamilton County...passing through Noblesville until it reached William Conner's trading post at what is today Conner Prairie Farm. Looking up from the bank of White River along what is now the River Walk, a pedestrian parkway, what was once part of Chief Anderson's Delaware village is now the location of several businesses. The steeple in the background is St. Mary's Catholic Church where the long house or council house of the Delaware was located. The Lenape village would have covered this and the surrounding blocks. Not only did Chief Anderson recognized the importance of this location, but also did Captain John Berry,1777/9-1835. As stipulated by the 1818 Treaty of St. Mary's, the Delaware/Lenni Lenape were required to vacate their lands in Indiana's New Purchase around 1821. It was in March of that year that pioneer John Berry, purchased from Chief Anderson's son-in-law William Conner (of the Conner trading post mentioned above) the chief's village referred to by white settlers as Anderson's Town/Andersontown. Berry, in the summer of 1823, laid out the original plat for Andersontown. The plat followed the same design as Chief Anderson's original Delaware/Lenni Lenape village and trails. 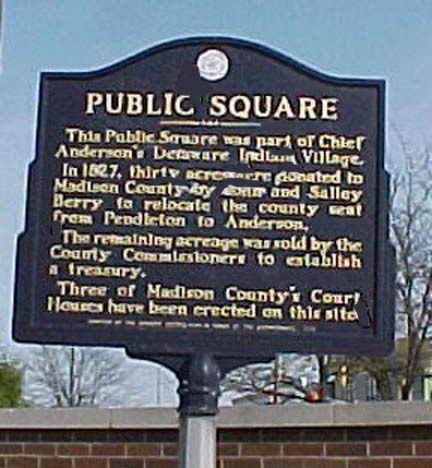 In November of 1827, Berry donated the land for the public buildings with the condition that the county seat be moved from Pendleton to Anderson. As the marker, above left, from the National Register of Historic Places explains, the Gruenewald house, right, northwest of the Madison County Jail, seen at the top of the page, was originally the site of one of Capt. 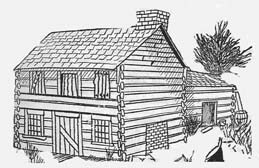 John Berry's log cabins. Berry received his land patent from President Monroe in 1823 and purchased the Lenni Lenape village from William Conner, son-in-law of Chief Anderson. 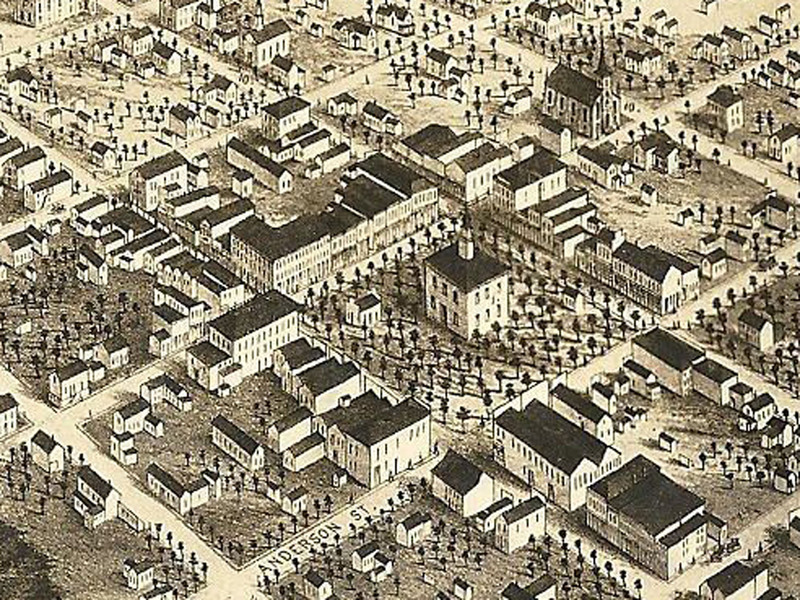 This early map shows what Anderson looked like in the 1860s. It is still a small town, not much bigger than the Lenni Lenape village on which it sits. While the city had two railroads, it did not have a foot/passenger bridge across White River. Horses and wagons, people on horseback or on foot had to cross using one of the ferries. The shaded block is the town square where the court house and other early public buildings were located. On the west side of the town square was John Berry's two-story log cabin and inn. 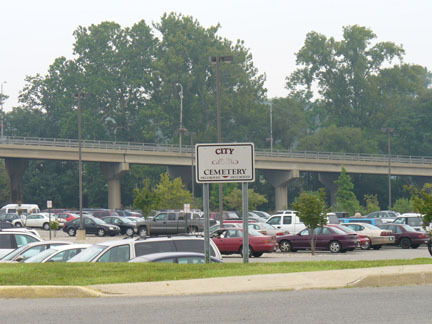 The first cemetery, pictured left, for Anderson's local residents was an area donated by founder Captain John Berry. Before that, though, the land was part of Chief Anderson's village. This location was repurposed in mid 19th century when the Pan Handle Railroad Company needed gravel for construction and so excavated the site. Some of the remains of early settlers were essentially used for fill dirt. The location of the first city cemetery is shown in the map towards the top of the page. Anderson's founder was a large man for his time, weighing almost 200 pounds, and he is said to have had a commanding, military bearing. He is not buried in Madison County. John Berry became ill while driving a herd of hogs north to market and died in Huntington, Indiana; he is buried there. 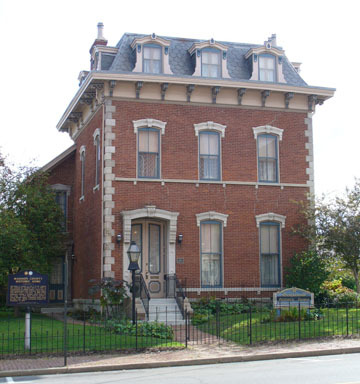 Before coming to central Indiana, John Berry and his family lived along the Ohio River, and by 1808 they were living in Ripley County in the southeast section of the state. From there--as the Indiana Historical Bureau's marker at left explains--Anderson's founder cut a trail into Indiana's central section. 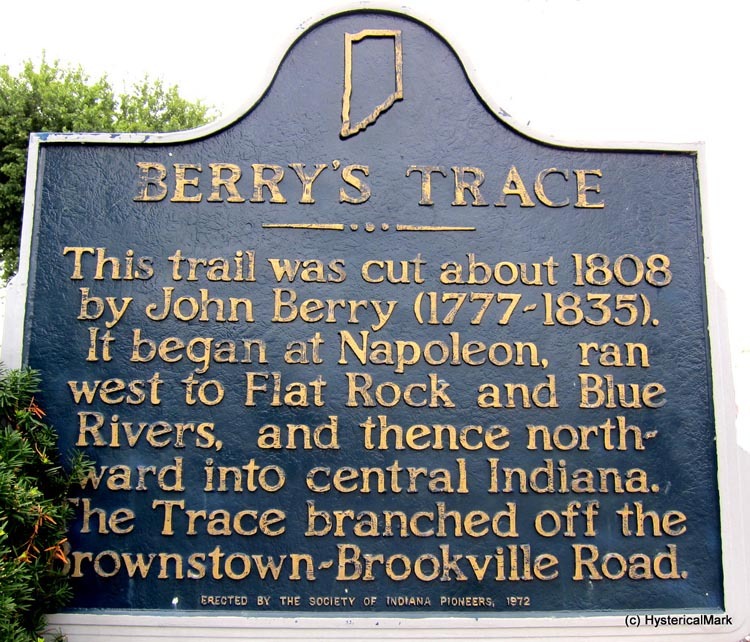 This trace was the first marked path or road for families wanting to settle in what would become the region of Indianapolis. The first business developers to Andersontown were the brothers Allen and Alfred Makepeace. As merchants, they arrived as early as 1820--before Berry--to the Delaware village on the Wapihanne/White River and began selling goods and supplies from their wagons to the Native Americans and later to the early settlers. The rest of the Makepeace family, including father Amasa, entered the county around 1821. The family began a commercial legacy. While Amasa and Allen centered their financial activities in Chesterfield in Union Township, Alfred focused on the new settlement of Andersontown. Alfred's business enterprises over the years helped change the little town into a city. During his life he amassed a great deal of property and eventually built the U.S. Hotel in 1852, a showcase for its time. Additionally, Alfred also platted and helped organize the town of Frankton in Pipe Creek Township. Alfred died in 1873 and is buried at West Maplewood. This picture shows what Anderson looked like in the mid 1850s. The town square with two-story, lumber-framed courthouse with cupola is center; the courthouse faces east toward White River. Alfred Makepeace's L-shaped U.S. Hotel is left of center. 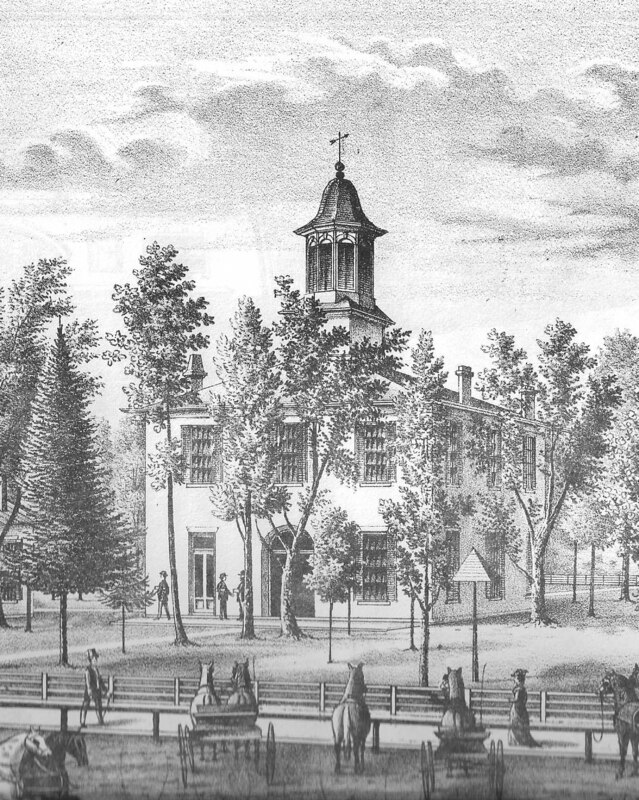 The first courthouse to be located within Anderson's town square is illustrated at right and above. This frame structure existed from 1839 to 1880 when it was destroyed by fire. Another important establishment in Anderson Township for pioneers was the "One Mile House." This was a hotel positioned on South Bank Road (8th Street) where the road crosses Green's Branch, a mile or so from the town square. This travelers' inn was also unique because it was built by a woman. Although her first name has been lost, Mrs. David Harris settled in the township with her husband in 1826. He died the following year, and his independent, intrepid widow commissioned the construction of this hotel in 1839. It was a popular place for social gatherings for many years and became a landmark for the many settlers traversing the New Purchase. As an interesting cemetery footnote, Mrs. Harris's husband's body was reportedly interred according to historian John Forkner "in the old Indian burial ground." 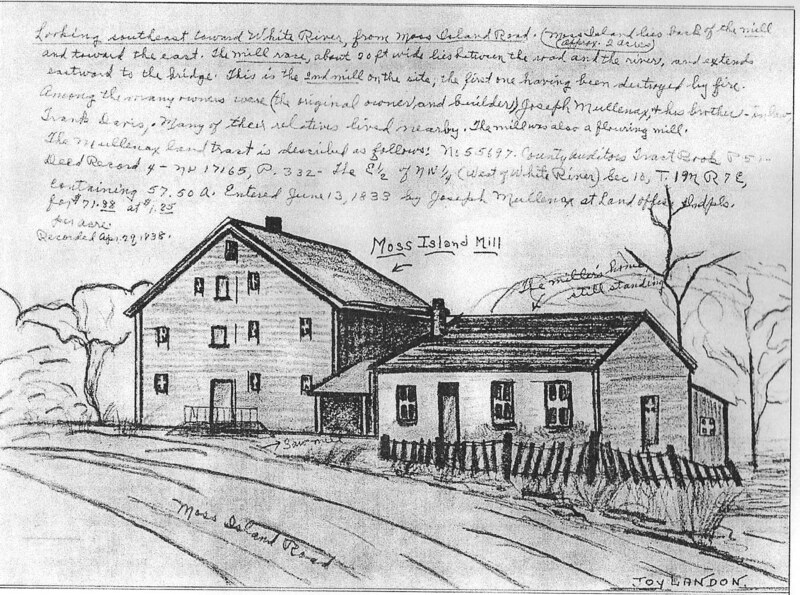 This drawing of the "One Mile House" was taken from John Forkner's 1914 History of Madison County, Indiana. Mills were one of the most important additions to pioneer life. A mill transferred the power of a river's current to grinding stones or cutting blades through the use of a large wooden, paddled wheel situated in the river. The grinding stones converted hard grains into usable flours ,and the blades turned timber into lumber. Thus, pioneers and early settlers had the two most important necessities for survival--food and shelter. According to local county history books, the Moss Island Mills were built in 1836 by Joseph Mullenax. Before that year, the closest mills were in Perkinsville down river and Pendleton overland fourteen miles away. The Moss Island Mills were on the White River and only three miles from Andersontown. They were the hub of industry and farming and benefited everyone in the surrounding townships. Looking southeast toward White River, from Moss Island Road. Moss Island, approximately two acres, lies back of the mill and toward the east. The mill race, about 20 ft. wide lies between the island and the river and extends eastward to the bridge. This is the 2nd mill on the site, the first one having been destroyed by fire. Among the many owners were (the original owner and builder) Joseph Mullenax and his brother-in-;aw Frank Davis. Many of their relatives lived nearby. The mill was also a flour mill. [The artist has the structure labeled as a "saw mill" at the large entry at center.] The Mullenax land tract is described as... Entered June 13, 1838...at land office Indpls. (Indianapolis). The first doctor Dr. Burt Dickinson arrived in 1826/7. The first log school was built in 1833. It was on Central Avenue between 10th and 11th streets where the Anderson Public Library is now located (how symbolic). The first newspaper the Federal Union started in 1834. 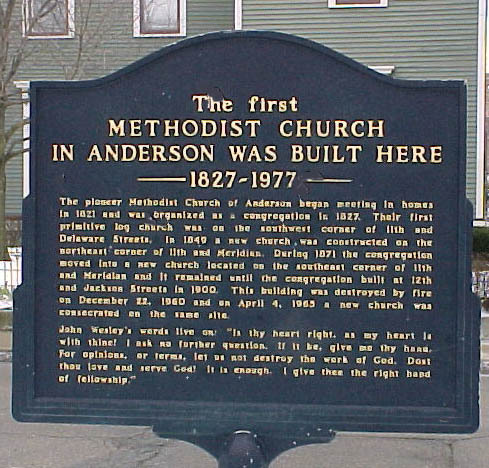 Andersontown was finally incorporated in 1839, and in 1844 its name was shortened to just "Anderson." 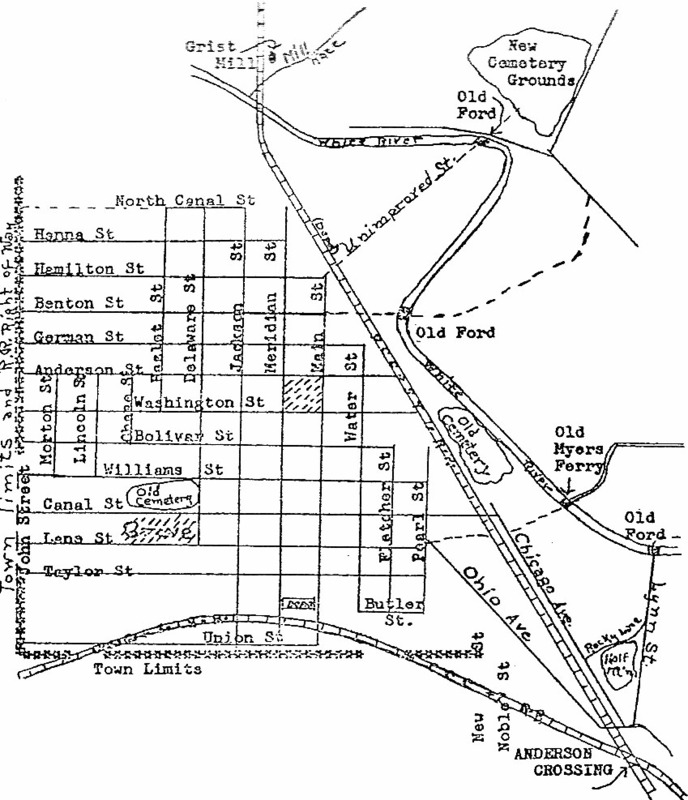 As the map above shows, across Grand Avenue from West Maplewood Cemetery was one of the old fords by which early residents crossed White River. This picture shows that general area of the river. The foundation stones in the foreground are from a later bridge now improved upon by the Eisenhower Bridge in the background. The historic sections of river bank, which once held the Delaware village and later settlement of Andersontown, are now overseen by the parks department and include walking paths. As the map above shows, growth was slow for Anderson, the former Delaware village. In 1838, Anderson's population was 350. Twenty years later, in 1850, there were just thirty-two more people living in the county's government center. Other settlers into this area were the families of Eli Harrison, John and Christopher Davis, Daniel Harpold--the contractor who built the first court house--William and Isaac Young, William Allen, William Curtis, and Samuel Kinnamon. 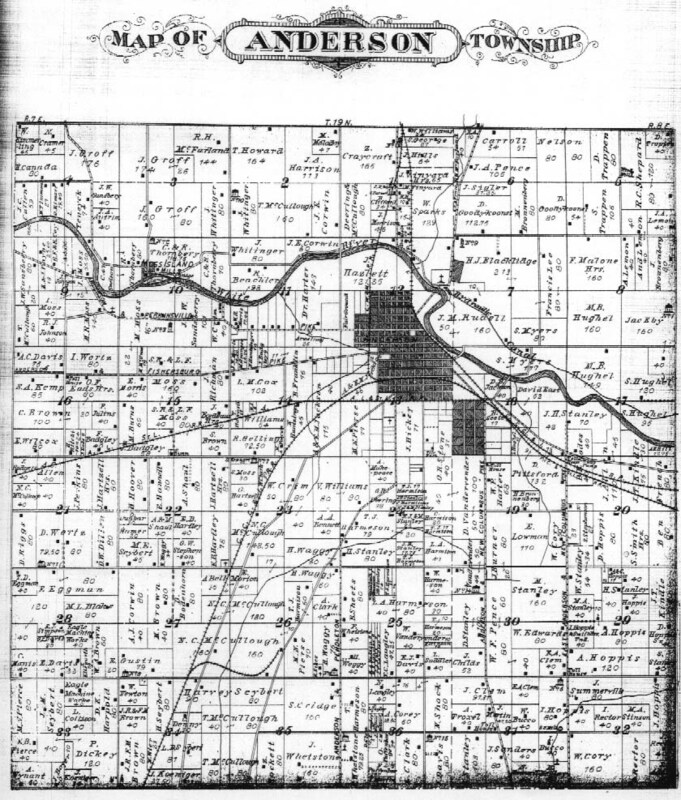 The 1876 plat map for Anderson Township shows the city of Anderson taking up only parts of sections 12, 13, and 19. 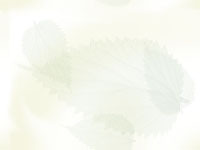 The cemeteries recorded on modern lists for early settlers in the township are the Abbott, Bucco/Bocco/Booco, City Cemetery (removed; see West Maplewood), Harmeson, Hartley (destroyed), Moss/Moss Island, Pleasant Walk/Waggy/Wilson, St. Mary's, Summit View/Gospel Trumpet, Tharp/Thorpe (removed; see West Maplewood), Vandevender (destroyed), City/Anderson/West Maplewood, and Whetstone.